Normally in the case of movie tie-in games, they tend to launch along with the theatrical release of the movie they’re based on, which wasn’t the case for a few Spider-Man 2 games because the hardware to play them on simply wasn’t out in time for the movie: The PSP wouldn’t come out until early 2005, and the first iteration of the Nintendo DS wouldn’t launch until late 2004, which was months after the theatrical release of Spider-Man 2. The first and second Spider-Man movie games on the Game Boy Advance were okay 2-D side-scrolling action games that are pretty forgettable in the long run and given Spider-Man’s Nintendo portable history, you would expect similar things on the DS. Spider-Man would go on to have quite the career on the DS, in fact the system is home to some of the most enjoyable Spider-Man games, however judging from Spider-Man 2, a game that launched with the DS in North America, you would think the exact opposite of that would’ve happened. While the Game Boy Advance release of Spider-Man 2 was nothing spectacular and did little to differentiate itself from the first movie game, Spider-Man 2 on the DS is a frustratingly difficult game that used the DS hardware in every way except the one that would’ve made it enjoyable. Spider-Man 2’s story is about what you would come to expect from a Spider-Man movie game, in so much as to say it uses the base conflict between Spider-Man and Doc Ock from the film and sprinkles in other villains from the comics. Plot wise it has most in common with the PSP game as it includes the Vulture, who didn’t appear in either the console game nor the GBA title, and also features J. Jonah Jameson in cut-scenes. The story is told via stills with no voice clips taken from either the console or PSP game of the game name. Given the caliber of the film cast’s participation in these products, that’s not necessarily a bad thing. 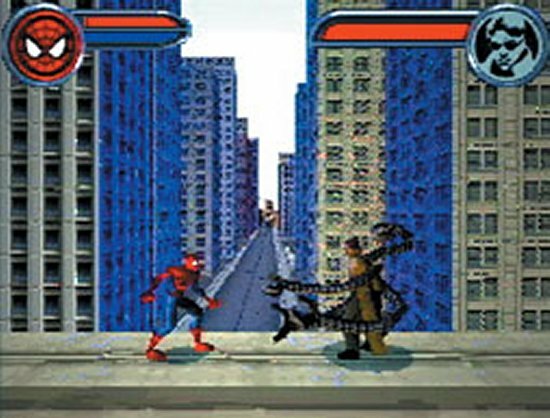 The Game Boy Advance Spider-Man movie games were 2-D side-scrollers and so to is the first DS movie title. Developer Vicarious Visions, who took over development duty from Digital Eclipse who worked on the GBA titles, used the extra power given by the DS however to give the game a 2.5-D asthetic with the title character moving along a 2-D plain against environments with some 3-D depth to them. The visuals don’t pop quite as much as the GBA games, but Spider-Man 2 is still a decent looking game given that it released at a time when developer were still getting used to what the original DS could do. Other games like Spider-Man 2’s immediate follow-up, 2005’s Ultimate Spider-Man, would adopt an almost cel-shaded look to emulate the style of the more comic book source material, but for the purposes of the Sam Raimi movie universe, Spider-Man 2’s real world inspired visuals are better suited in adapting the source material. A problem suffered by the Spider-Man movie titles on the GBA is that the mechanics of being Spider-Man, things like web-slinging and zipping to walls and ceilings on a web-line, never felt as good as they should which is something that’s not the case with the first DS Spider-Man game. There’s no awkward, half-circle motion when Spider-Man zips to a surface, instead he’ll just go to where you want him to provided there’s a ledge in which to go to. To web-swing it’s just a simple matter of jumping, and then hitting the same button to swing. It’s fine, but it’s obviously not as important as Spider-Man 2 on console when it comes to getting around. Combat is pretty basic, however there are moves that you can find and swap between by tapping on the lower screen. Given how the levels are designed though, the second screen should have had another more important function: a map. 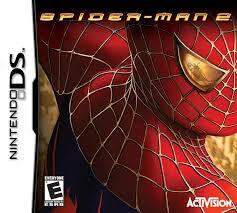 Spider-Man 2 on the DS is a good feeling Spider-Man game to control, however it’s not a very fun Spider-Man game. The Game Boy Advance games featured open, non-linear levels where it was often easy to get lost; Spider-Man 2 has that problem as well only dialed up to 11. Every level is a maze with multiple pathways where you’re tasked with things like saving civilians and finding bombs before you’re allowed to exit. It’s incredibly easy in nearly all stages to get turned around, lost, and just end up backtracking across entire levels trying to find that one thing what will let you move on. Spider-Man 2 promotes replay value in getting you to go back through stages again and beating time trails as well as doing optional objectives, but you’ll mostly struggle with getting through stages once, let alone twice. Levels are at their worst when you have to defeat a number of enemies before you move on, because should you die fighting them, you have to go all the way back to the start and find everything over again. This comes to a head in the second-to-last level where you have to find twelve terminals in order to finish the level, however the entire stage is filled with fall-in-and-you’re-dead pit falls and enemies that will knock you into said pits while you’re trying to web-swing around. Having lives like in the Game Boy Advance game would have helped alleviate this a lot, as would having mid-level checkpoints, but mostly this game sorely needed a map. It also doesn’t help that it’s once again not very fun to fight enemies. Simple stage enemies can easily overtake you and take away large portions of your health. It’s nearly impossible to kill aerial enemies, either with your physical attacks or web-based projectiles, which is a pain in the “destroy all enemies” levels. You have a counter mechanic where if you hold the L-shoulder button at the right time you slow time which works within the context of the character and assists you a little, but it’s normally wise to just avoid enemies all together. In the early days of the DS, developer were trying to figure out what exactly to do with the lower screen with titles like Super Mario 64 DS and Rayman DS using it as a clunky virtual analog stick for example. Spider-Man 2’s use of the screen is trivial at best, and obnoxious at worst. Mostly it’s used to swap between a few moves like firing web-projectiles and yanking enemies towards you which is fine, but other times it just slows down things, especially in boss fights. When fighting characters like Doc Ock and the Vulture, encounters will come to a complete stop while you tap on projectiles and other things being thrown at you. It would feel less egregious if this did any extra damage to them if you manage to do everything correctly, but instead it’s just a mini-game thrown in to hit the “we have touch screen support” check box. If you’re patient and can look past some of Spider-Man 2’s frustrating aspects, there’s a decent controlling Spider-Man game buried on the cart. The caveat though is that you must have a lot of patience because that’s what it’s going to take to get through this game. 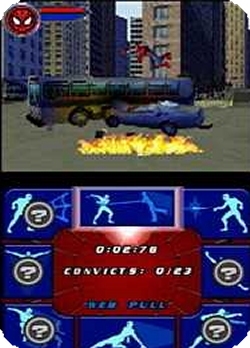 Even at the time when it was new, there was a much better and well-meaning Spider-Man 2 game that could be played on the DS in the form of the GBA game of the same name. Now, looking back on the DS family, including the 3DS, there’s not only much better Spider-Man games, but much better Spider-Man movie games at that. Spider-Man 2 is only for the most dedicated fans of the property; A far cry from every other game based on the second Raimi film.